Exploring archaeological wonders of ancient eras in India have been a dream of travellers from all parts of the world. There are a number of cities in India that have their own importance in the International tour and travel map. Among all the cities, Delhi, Jaipur and Agra are main as travellers wish to visit the Taj Mahal, Red Fort and royal palaces of Jaipur. Keeping the popularity of these places in mind, Friends Travel Services has come up with affordable Golden train tour packages that cover these three major cities by India Tour Package. Day 1 : Arrive Delhi Arrive at Delhi our services begin here Namaste! Today you will arrive at the Indira Gandhi International Airport in New Delhi. A Friends Travel Services representative will be waiting for you with a sign bearing your name and you will then be transferred to your hotel. Rest of the day is at your leisure. Stay overnight at the hotel in Delhi. (In case of any difficulty Call us on our 24 x 7 No. +91 9818243600). Day 2 : Delhi City Tour with Personal car & Driver For the below trip The day begins with breakfast followed by visit to old and New-Delhi Rajghat, Shanti Van and Shakti Sthal are memorials to Mahatma Gandhi, Jawaharlal Nehru and Indira Gandhi respectively. Shah Jahan’s imposing citadel the Red Fort was built at the eastern extremity of the walled city along the river front. Jami Masjid the biggest mosque was also raised by Shah Jahan. It is the largest mosque in India . Break for Lunch in a good restaurant in the vicinity. By afternoon the tour proceeds towards Old Delhi. Day 3 : Delhi to Jaipur by Train Early morning our driver will pick you up & transfer to New Delhi station to board train to jaipur. Breakfast in the train. Enjoy the journey in this super fast train. Oupon arrivel in jaipur pick & Transfer to your hotel.By afternoon you mayl visit jaipur city place or markets or rest in the hotel.Overnight at jaipur. Day 4 : Jaipur city tour with Personal car & Driver For the below trip This morning after breakfast proceed to jaipur city tour. Places to visit Amber Fort in the outskirts of Jaipur. Enjoy the jeep ride ascent to the fort or by elephant ride up to Amber Fort- built in 16th century by Maharaja Man Singh, it sprawls on the hillside. Its construction was started by Raja Man Singh but completed by his descendant Jai Singh. Amber is the classic romantic Rajasthan fort palace. About Jaipur city is divided into nine squares each signifying god of wealth. The regal spaciousness of the city palace at the centre gives way to markets and residences contained within walls pierced by seven gateways. visiting sightseeing places within the city like 1799 built 5-storied Hawa Mahal in old city, 1728 constructed Observatory the Jantar Mantar, central museum housed in Albert Hall, Ram Niwas Gardens zoo and crocodile breeding farm, or visit places in and around the city. Gaitor cenotaphs of the royal family, the Sun Temple at Galta with a deep gorge in its backyard.Sisodia Rani Palace & Gardens with mural decorated walls or the Vidyadhar’s Garden. By evening return to your hotel. Overnight at jaipur. Day 6 : Agra to Delhi by Train. This morning after breakfast you will visit the seventh wonder of the world Taj Mahal Described as the most extravagant monument ever built for love, it was constructed by Mughal emperor Shah Jahan as a memorial to his queen Mumtaz Mahal. From here you will visit AGRA FORT. It is a UNESCO world heritage site located in Agra . It is the most important fort in India . The great Mugals, Humayun, Akbar, Jehangir, Shah Jahan and Aurangzeb lived here, and the country was governed from here. From here proceed to Visit Sikandra is the tomb of Akbar; construction started within his lifetime and was completed by his son Jehangir in 1613.you may also visit Markets in Agra finely in the evening you will be transferred to railway station to board the train to Delhi . You will have an impression of TaJMahal and a sheer magic that the Taj exudes making it an unforgettable and cherished image forever. On arrival at Delhi you will be dropped at your hotel by our Driver. Overnight in Delhi . In case you want visit fatehpur sikra same can arranged in the trip. Day 7 : Transfer to Airport This morning after breakfast you will be transferred to Airport or railway station for your onwards journey. 06 Nights accommodation in Tourist class hotels with privet bathroom & breakfast on twin sharing basis. The rooms are normal European style room with nice soft bed. All sight seeing as per above itinerary by Air-condition tourist car. In Delhi Agra Jaipur . As per the above tour. 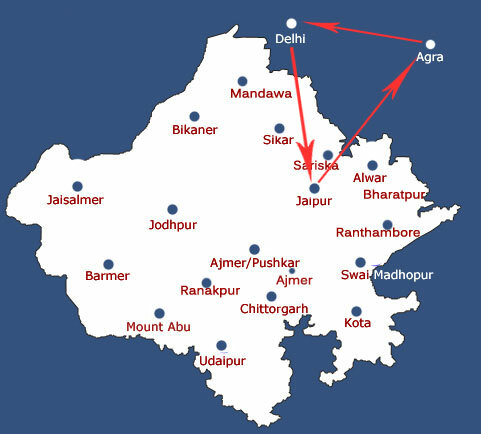 Train tickets Delhi Jaipur Agra Delhi By air-condition Trains. One time Visit to TajMahal & Agra Fort. One Elephant Ride In Jaipur. One Rickshaw Ride in Old Delhi Chandnichowk & spice market.